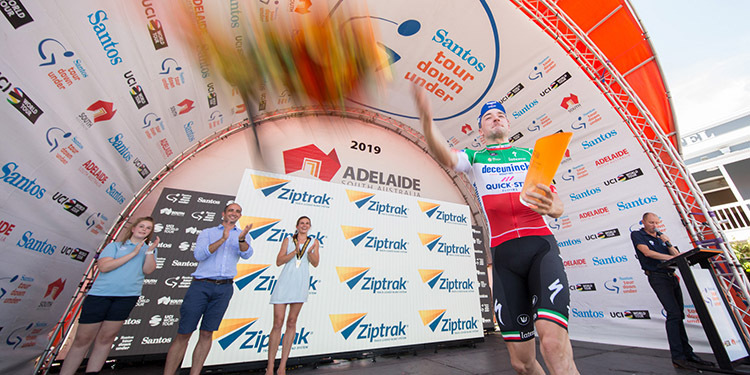 The Ziptrak® team were thrilled to be a major sponsor of the Santos Tour Down Under in 2019! 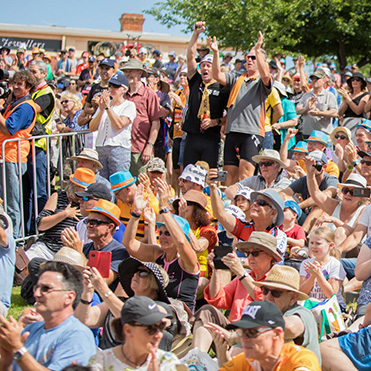 Hundreds of thousands of people from around Australia and the world came together to cheer on world-renowned riders from all corners of the globe. 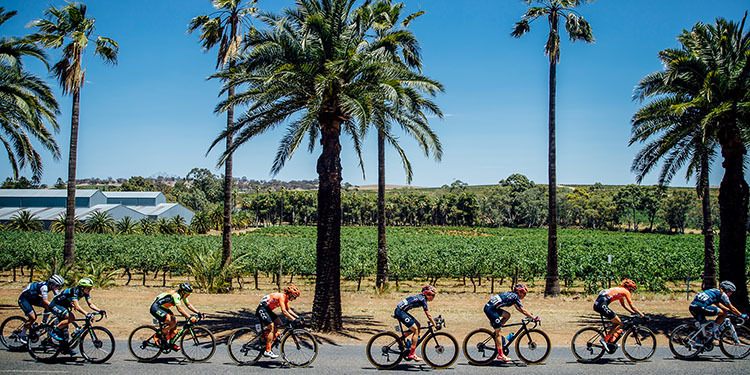 South Australia is the perfect backdrop for Australia’s greatest cycling race, offering picturesque regional towns, beautiful wineries, gorgeous coastlines and bustling city streets. We’ve rounded up a collection of the best moments and stories throughout the event. It was a pleasure to see the best cyclists in the world travel through our backyard, surrounded by thousands of cheering spectators – including a couple of Joeys! 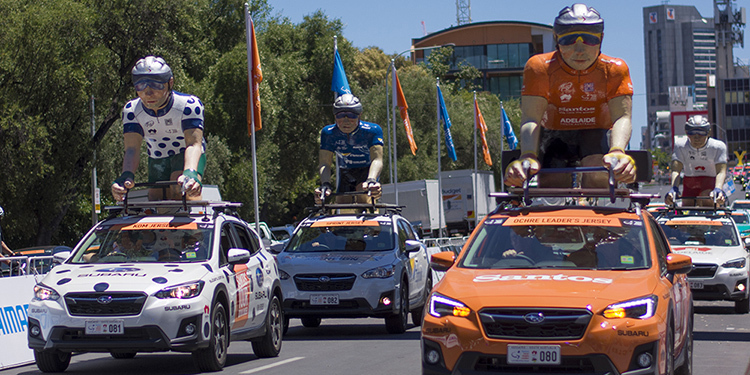 The Ziptrak® Sprint Jersey Torso vehicle raced along the track, about 20 minutes ahead of the professional riders, in a convey of 20 Subaru vehicles, known as the Tour Parade. Spectators placed themselves along the route, eagerly anticipating the arrival of the riders convey. Spectators jump up to cheer on the Tour Parade, and ready their position for the professional riders who were not far behind. From the Parade Vehicle, the Ziptrak® team saw South Australian ingenuity at its finest, with spectators beating the heat by bringing small swimming pools to the road’s edge! Spectating the event in the heat of January can be tough (let alone riding it! 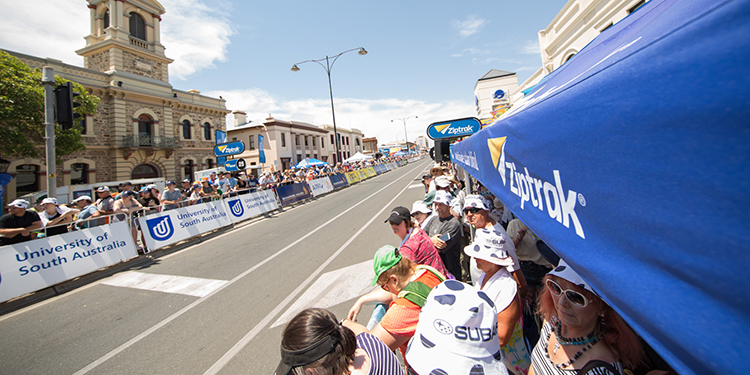 ), so Ziptrak® provided shade zones, not only along the sidelines but in the Victoria Square / Tarntanyangga Tour Village. We installed over 100sqm of shade in the Tour Village, providing a comfortable space for people to enjoy food and drinks each afternoon and evening during the event. The women’s races started on Thursday the 10th of January, with all the teams riding together, testing the waters of their competitors. Letizia Paternoster the Italian young rider from Trek-Segafredo took everyone by surprise with a fearless mindset, winning Ziptrak Stage 1 and wearing the Ochre Jersey, – Congratulations again Letizia, you were brilliant! On Sunday the 13th of January, kids of all ages were given the opportunity to feel like a UCI WorldTour rider by riding a loop on the official track in front of the grandstand. 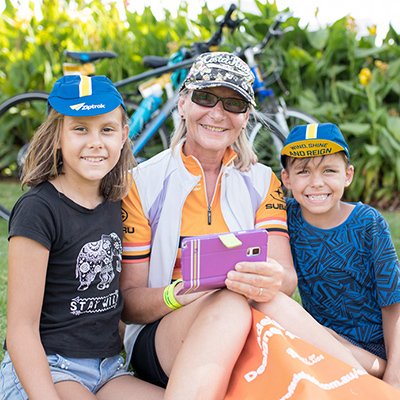 The Mini Tour for Kids kick-started a day of family-oriented activities which then transitioned into the Down Under Classic later in the afternoon. By mid-morning, Ziptrak® staff had installed about 1,000 bike horns onto children’s bicycles. The squeaking noises could be heard all afternoon, giving kids the opportunity to make just as much noise as the adults, celebrating as their favourite professional rider flew by. Perhaps not every parent was a fan of the squeaking noise the horn made – sorry! From the beginning Sarah Roy from Mitchelton Scott team achieved the highest cumulative sprint points, but wasn’t easy, strong competitors like Chloe Hosking from Ale Cipollini and Alison Jackson from Tribco-Silicon Valley Bank, put up a fight for the Ziptrak® Sprints but Sarah kept the Blue Jersey throughout the event and was awarded as overall Ziptrak® Sprint Jersey winner. Amanda Spratt from Mitchelton Scott was fantastic and despite 37-degree heat on Novatech Stage 2 she managed to finish first, claiming the Ochre Jersey and keeping it till the end. Amanda’s strength inspired many young girls, including her smallest (but biggest) fan Molly! The exceptionally bright 8-year-old girl has followed her idol across the country, conducting interviews and practicing on the road. Our team witnessed Amanda’s kindness towards Molly, giving her the winning flowers bouquet! Thanks Molly’s Mum and Dad for sharing your story and all the best for your budding journalist! Ziptrak® will continue supporting these amazing women through this event in the following years. There’re usually dramatic and unfortunate events unfolding on the track and this year was no different. The legendary Patrick Bevin from CCC team crashed with only minutes left on SouthAustralia.com Stage 5. Bevin showed what determination looks like, immediately asking for another bike to keep going! He caught up with his team mates and finished the race. We can’t imagine the pain he went through as falling off a bike at 60km/h is no joke! Regardless of the bruises, Bevin completed on the final race taking the blue Ziptrak® Sprint Jersey home. As the Stage 1 naming rights sponsor for the Women’s and Men’s races, along with the daily Sprint Jersey sponsor, Ziptrak® proudly supports this famous event, underpinned by a great number of people, organisations and companies. 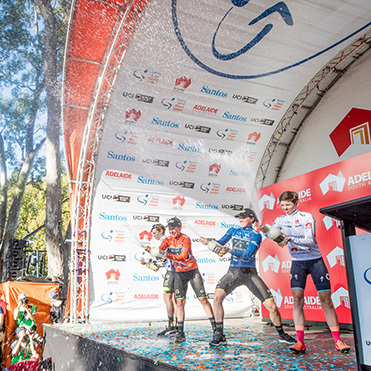 Everyone involved was dedicated to helping the riders and teams achieve their absolute peak performance and showcasing the beauty of South Australia. Thanks again to everyone involved with making the Santos Tour Down Under 2019 a huge success! Ziptrak® staff are already busy preparing for another huge year in 2020.